It was 1945 and the Chicago Cubs were in the World Series. In fact, it was the last time the Cubs were in the World Series. And a Greek immigrant restauranteur named Billy Sianis brought his pet goat to the game. It was Game 4 and people complained about the odor of the goat. Sianis and his pet were ultimately ejected from the game and Sianis cursed the Cubs. That curse has plagued the Chicago baseball team since then, as generations of fans and sports journalists have long blamed Murphy the goat for the almost seven-decade-long dry spell of the Cubs. Until tonight— when the Chicago Cubs finally won the World Series. And the curse of the Billy Goat has officially been eradicated from the Windy City. William “Billy Goat” Sianis was born in Greece in 1895 and emigrated to the United States in 1912 and settled in Chicago where many of his fellow countrymen had already established themselves. Sianis taught himself English by reading newspapers and became a sports junkie— particularly a baseball fan. Just months after the repeal of Prohibition, he bought the Lincoln Tavern, a bar across the street from the Chicago Stadium (now site of the United Center in the West Loop area of Chicago) for $205. Not long after he bought the Lincoln, a live baby goat fell from a truck that was driving by just outside the tavern, probably heading to the nearby stockyards. Sianis told a friend that goats reminded him of his birthplace and he nursed the animal to health, dubbed him Murphy. 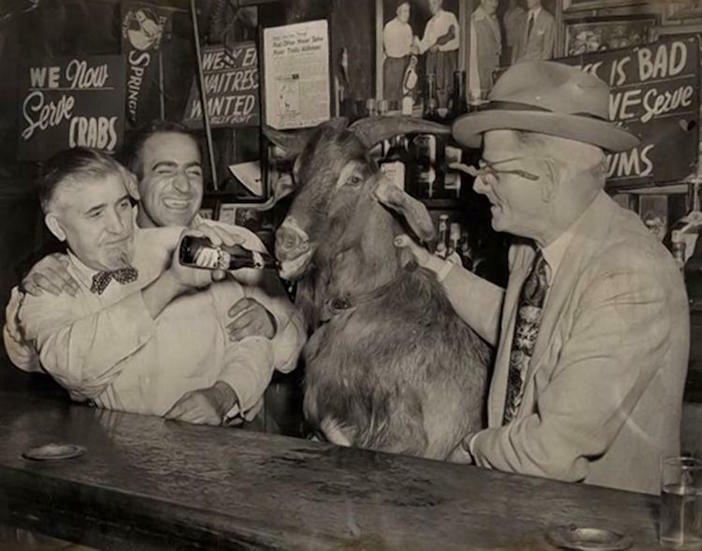 Sianis himself grew a goatee and renamed his bar The Billy Goat Inn. Those who knew him recalled what a character he was. In 1944, when the city hosted the Republican National Convention, he posted a sign outside the door saying “No Republicans Served Here.” Angry Republicans went inside to inquire why, only to find themselves getting served after all, and in large numbers. 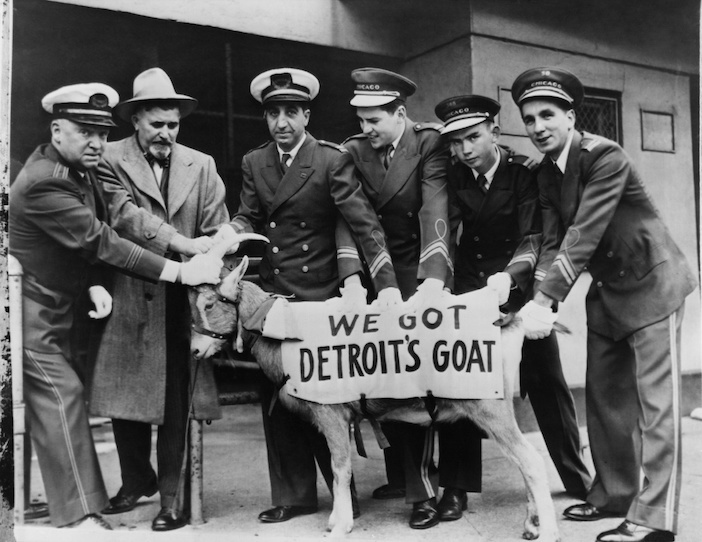 Ushers tried to give Billy Goat and his billy goat the boot before the game started, but Sianis argued he’d paid for two box seats and thus they should be allowed to stay. And they were, until the 4th inning. Then the ushers arrived again and told Sianis that someone had complained about the goat’s smell. The pair were asked to leave. Accounts vary as to what happened next, but all agree that William Sianis was not pleased. Some say that he cursed the franchise there and then, declaring that no World Series games would ever again be played at Wrigley Field. Others contend he said it was the Cubs who would never appear in another series, regardless of venue. Sianis’ family maintain that, still angry the following day, he sent a telegram to Cubs owner Phillip K. Wrigley saying the team would lose the 1945 World Series and never win (as opposed to appear in) another, all because they had slighted his beloved goat. Whatever version of the curse was actually delivered, all remained in effect— until tonight. The Cubs lost the 1945 World Series. No World Series games was ever held at Wrigley until this year. And the Cubs hadn’t won a World Series game, nor even appeared in one, for 65 years— until tonight.